On paper (and at times on screen), the premise of director Eugenio Mira’s new film comes across as utterly ridiculous. 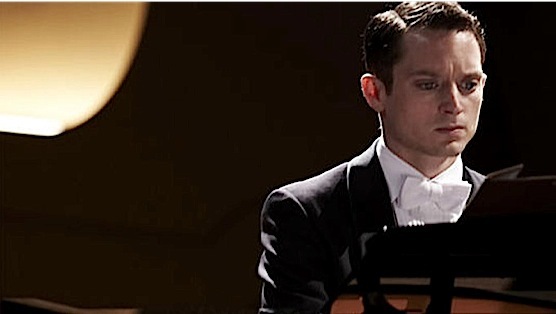 Tom Selznick, a piano prodigy played nervously and wide-eyed by Elijah Wood, has not performed in five years after butchering the last four bars of an “impossible” piece written by his inimitable grandfather. He decides to get back onstage, his movie star wife Emma (Kerry Bishe) in the audience, but when he sits down to play he finds a note in his sheet music that says, “Play one wrong note and you die.” Though understandably a bit shaken, he proceeds to perform the piece with a high-powered sniper rifle’s laser point aimed at his head, his wife, and various audience members—as every review will most likely mention, Tom must literally perform under the gun. Remarkably, Mira and his cast, including John Cusack as the voice of the evil mastermind talking into Tom’s ear (he does appear near the end for a brawl in the lighting rigging), and Bill and Ted’s Alex Winter as a murderous henchman, manage to make this Roger Corman-esque plot utterly entertaining and engaging. The trick for the viewer here, as is the case with most movies in the thriller genre, is to completely suspend your disbelief. As Tom arrives at the theater where he will make his comeback appearance, he is constantly harangued and harassed by snide comments and notes telling him not to choke. Why would the crew at the theater be so unsupportive? Who knows? How on earth could someone perform such a complicated piece in front of a huge audience while simultaneously texting and listening to death threats over an earpiece? Search me, but it doesn’t matter at all. Mira borrows the best elements of suspense masters like Hitchcock and De Palma to create a tense film with horror movie flourishes that tells its story in a compact 90 minutes. The film begins with a cacophonous introduction as a tense and discordant piano score plays over abstract imagery of the inner workings of a piano. The cacophony continues as Tom arrives in Chicago after a turbulent flight—city noises are amplified as he winds his way through the busy streets, only finding uneasy respite in his dressing room at the theater. Wood’s build and demeanor is almost preternaturally suited to play this type of character. His elfin frame and gaping blue eyes read apprehension even before he speaks. And apparently he’s made enough money from The Lord of the Rings trilogy and his FX TV show Wilfred to give little indies like this a shot. The film takes place more or less in real time once Tom arrives at the theater. When he takes the stage and begins to play, the action must take place over the course of his performance, a challenge that is well met by the filmmakers. Some complicated, swooping shots are employed to this end, but instead of distracting from they add to the suspense. Wood apparently actually plays in some shots, although clearly he’s not responsible for the virtuoso ivory tickling on the soundtrack. But the editing and shot selection creates a seamless illusion that doesn’t distract from the enjoyably ridiculous proceedings. Grand Piano should be taken with a winter’s supply of road salt, but if you can get past the absurdity of it all you are in for a pretty good time.